T-Series are proud to present the brand new single released by Balraj entitled “Meri Aashiquii“, music by G Guri!! Analog Records are proud to present the brand new single released by Balraj entitled “Kinna Payar“, music by G Guri!! 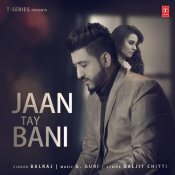 T-Series are proud to present the brand new single released by Balraj entitled “Jaan Tay Bani“, Music by G Guri!! ARE YOU Balraj? Contact us to get a featured artist profile page.